Unlimited Course Access 'Til You Pass! Upgrade your EA exam prep with Surgent EA Review Premier Pass. 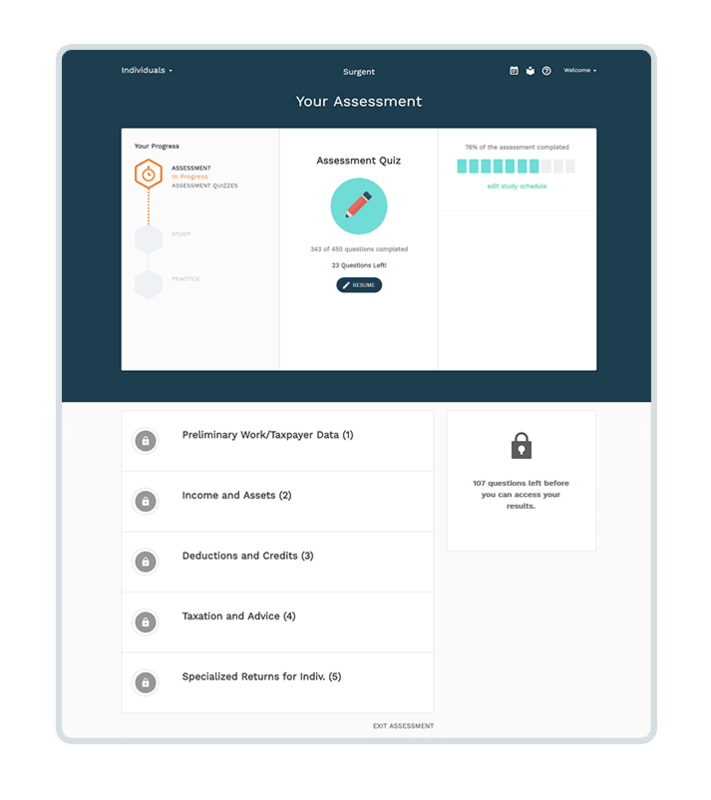 Surgent EA Review (formerly known as Exam Matrix EA Exam review) is powered by a proprietary adaptive learning software, A.S.A.P. Technology, which identifies your level of comprehension across all exam content areas, and generates daily study plans that are targeted to the areas you need to focus on. The result? You'll pass the EA Exam faster while studying less. Register For a free trial and see for yourself why so many Accounting Professionals choose the Surgent Enrolled Agent Review Premier Pass to prepare for and pass their exam. Experience a review that’s completely customized to you. With Surgent’s Enrolled Agent Review, you’ll be fully equipped to ace the EA Exam, while studying half the time as the other guys! By leveraging A.S.A.P. Technology to identify your level of comprehension by topic, study material is tailored to improving weaker spots, instead of wasting time on what you already know. Combine that with trending scores and unlimited practice exams, and the result? Unparalleled preparedness, confidence, and performance. Focus on weak areas – and turn them into strengths! Significantly reduce study time – half the time as the competition! Increase pass rates – Over 80%! 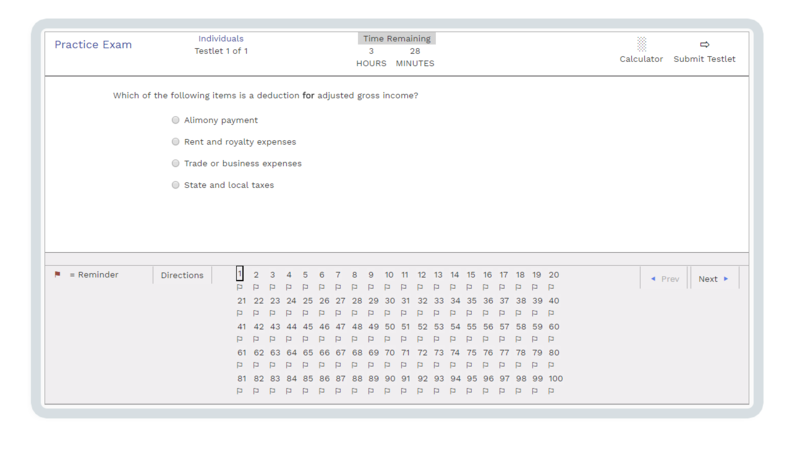 Complete a series of quizzes for our software to accurately assess your knowledge across all EA Exam topics. Answer 150 questions – enough for the adaptive software to get an accurate read of your performance in each subject area. Competitors claim to be adaptive – Buy many don’t test. Those that do ask 20-25 questions at most. What good does that do? The adaptive software then creates a custom study plan based on the results of your assessment, as well as real Enrolled Agent Exam topic weightings and ongoing study session results. A.S.A.P. Technology Our award-winning, proprietary adaptive learning software. You won’t find anything else like this on the market! Real-time algorithms ensure that daily study material is always up-to-date with your progress, so study material is always targeted to those content areas you need to focus on. The integrated Study Planner tool – helps you determine exactly how many hours you’ll need to devote to preparing for the EA exam based on your exam date, chosen study days, and mastery of material. 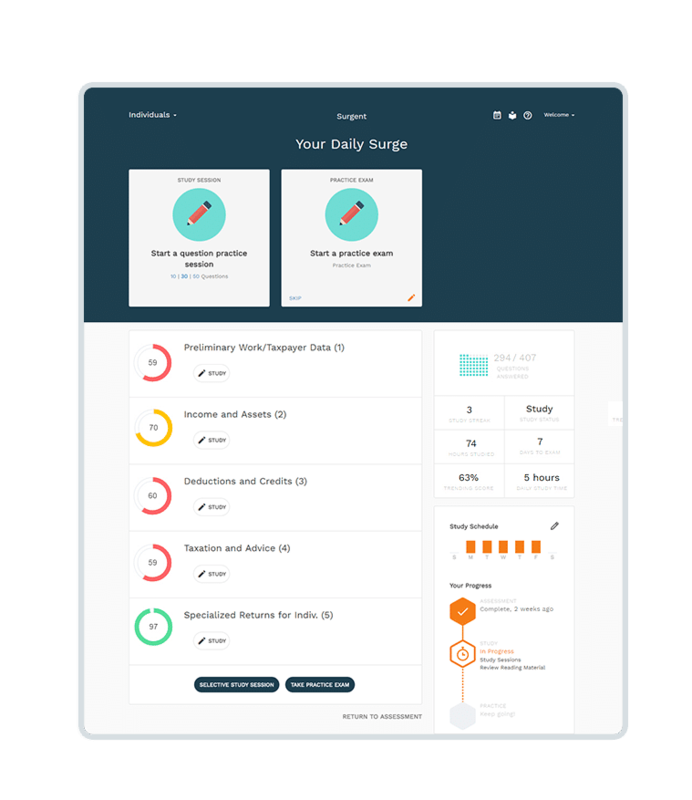 The Daily Surge dashboard – Your EA study material lineup, made up of Q&A and reading material. Round out your preparation by turning your focus to the final stage of studying: full practice exams. Unlimited practice tests – so you can go into the exam fully prepared! ReadySCORE – indicate performance, so know exactly when you’re ready to take the Enrolled Agent Exam! Go into the exam confident that you’ve been prepared by the most effective review software on the market.  Surgent EA Review students have a pass rate of over 80%! Read More about our Pass Guarantee here! "I struggled for over three years to pass the exam. Surgent CPA Review was definitely a huge key to my success. I was able to pass all four sections in a row. I studied with three other review courses and can say with confidence this one is the best."